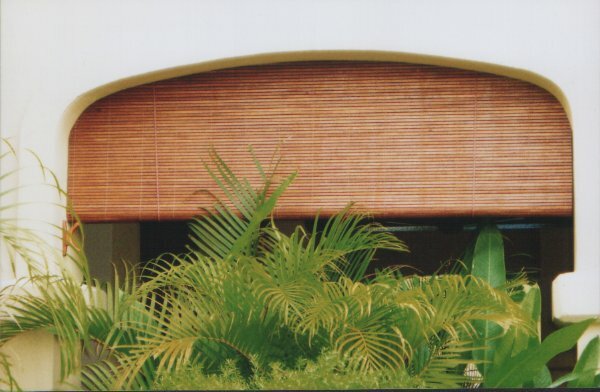 The resort style Tropical Outdoor Bamboo Blinds are mainly produced from "Bertam" Bamboo or commonly known as "Buluh Bertam" or "Buluh Attap" in Malaysian Language. "Bertam" Bamboo is only available in tropical countries such as in Malaysia. It is highly recommended for outdoor use in order to provide privacy, to block or keep out from hot sun and rain. As bamboo has its natural uniqueness, the colour toning and the width of each bamboo slat may differ. The colour of "Bertam" Bamboo surface is normally in brownish colour. The width for each bamboo slat is approximately 1/2" with half oval shape. Bamboo is a type of grass that multiplies itself and therefore is a sustainable resource. When you choose Bamboo Blinds, you make an ecological contribution that reduces demands for precious woods and help to save our rainforests. A Step-by-Step Process in Obtaining Tropical "Bertam" Raw Bamboo from Bamboo Forest by Malaysian "Orang Asli"
Good ventilation and circulation of fresh air & ideal to use for sun shade - you can still look out through windows while being shaded from the sun. For "Feng Shui" (Geomantic Omen) philosophy"
Can be use on balcony, pergoals, gazebos, living room, patio, etc.